MORGANTOWN, W.V. – On Sunday, March 24, the Villanova Wildcats traveled to Morgantown, W.Va., where they fell to the West Virginia Mountaineers by a score of 64-57 in the second round of the WNIT. With the loss, Villanova finishes its season with a 19-13 overall record, while West Virginia improves to 22-10 on the year. Villanova trailed 35-25 early in the third quarter, when the Wildcats went on a 13-4 run to cut the Mountaineer lead to 39-38 at the 4:29 mark. Four different Wildcats scored in the run with redshirt freshman guard Emily Esposito tallying four of the 13 points on a lay-up and a turnaround jump shot. Following a three-ball by senior guard Adrianna Hahn (Ursuline) that made it a 39-38 game, West Virginia scored the final nine points of the quarter to take a 48-38 lead after three. The Wildcats connected on 8-of-13 from the field in the third quarter for 61.5 percent, including a 3-of-5 effort from three-point range. Senior forward Jannah Tucker started the fourth quarter by connecting on back-to-back three-point field goals to pull Villanova within four at 48-44. 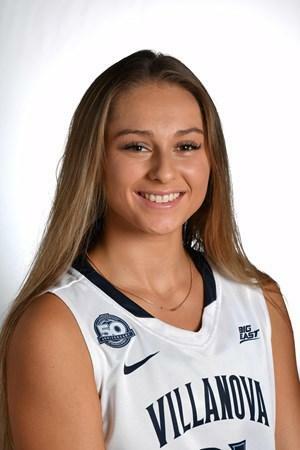 Following a lay-up by West Virginia freshman Kari Niblack that put her team up 50-44, the Wildcats answered with another three when sophomore forward Brianna Herlihy connected on a triple from the right wing. The Herlihy trifecta made it a 50-47 game with 8:15 on the clock. Two free throws by Naomi Davenport increased the Mountaineer lead to 52-47, before Esposito scored on a 10-foot jumper and Herlihy converted a driving lay-up to slice the West Virginia lead to one at 52-51 with 5:16 remaining. Mountaineer guard Tynice Martin then scored on consecutive possessions, including a conventional three-point play, to increase the West Virginia lead to 56-51 with 4:39 to play. 53 on two Niblack free throws, Hahn turned the ball over on Villanova's next possession. The Mountaineers took advantage of the miscue and increased the lead to 61-53 when Martin scored on an offensive rebound put back. Following the Martin basket, Villanova would not get within five over the last 2:44. In the loss, Tucker led the Wildcats with 21 points on 8-of-16 shooting, including a 5-of-11 effort from three-point range, while Esposito reached double figures for the second straight game with 10 points. Brianna Herlihy tallied nine points and a team-high 11 rebounds. This is the second straight game that Herlihy has grabbed 11 boards. West Virginia was paced by Davenport with a game-high 25 points and Martin who had 23 points. Niblack registered a double-double with 13 points and 16 rebounds. For the game, Villanova was 23-of-55 from the field (41.8%), 10-of-29 from three-point range (34.5%) and 1-of-3 from the foul line (33.3%), while the Mountaineers shot 36.7 percent from the floor (22-of-60), 21.4 percent from behind the arc (3-of-14) and 73.9 percent from the charity stripe (17-of-23). West Virginia owned a 41-33 advantage on the backboards. The Wildcats were called for 18 fouls, while West Virginia was whistled for just six fouls. NOTES: Villanova leads the all-time series with WVU by an 18-12 count…The Wildcats fall to 16-11 all-time in the WNIT…Villanova made 10 three-point field goals in the game. This is the 20th time this year that the Wildcats made double digits in threes, including in the last eight games in a row…Adrianna Hahn (Ursuline) finishes her career ranked seventh on the all-time scoring list with 1,503 points.